Megumu “Mego” Kobayashi has a twin brother, Mitsuru Kobayashi, the older of the two. 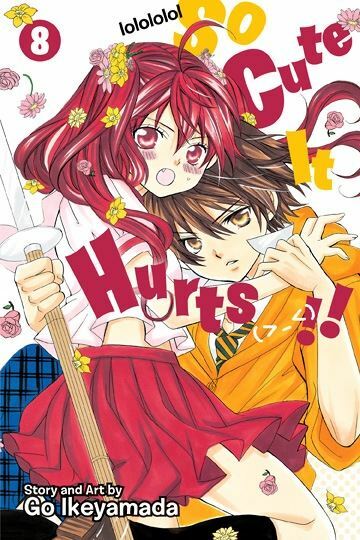 15-year-old Megumu is a full-on otaku and a history nerd, while Mitsuru, the popular and successful high school jock, is terrible at history. One day, dark-haired Mitsuru concocts the idea that he should put on a blonde wig and dress up as Megumu and attend her school, Tosho High. Meanwhile, Megumu will wear a dark wig, dress like Mitsuru, and take his history exams. This is not the last time the twins will switch places, especially when love is involved..
As So Cute it Hurts! !, Vol. 8 (Chapters 36 to 40) opens, Megumu finds herself in a bad position with Chiharu Uesugi, the new transfer student at Akechi Boys High School. He has some kind of prior relationship with Aoi Sanada, the love of Megumu's life, and now she must make a deal with Uesugi to protect Aoi's secret. Meanwhile, Mitsuru is again disguised as Megumu and attending Tosho High. He is doing this to protect school queen bee and teen model, Azusa Tokugawa, who knows his secret. He is playing bodyguard to protect Azusa from a pervert, but can Mitsuru and Azusa protect each other from their true feelings? THE LOWDOWN: I enjoy reading the So Cute it Hurts!! manga? I am certainly not in its target audience, but a good read is a good read. So Cute it Hurts!! Volume 8 is filled with rivalry and confrontation all around. Friends, lovers, and maybe-enemies have it out with each other. This lovely manga, however, is about love, and Vol. 8 is like a Valentine's Day special. Love is declared! So I must say, I love you, So Cute It Hurts! !